Commemorate the exciting time of pregnancy with maternity portrait paintings from Thomas Kinkade Portrait Studios. Our talented artists masterfully turn your maternity photos into unique works of art that will be cherished for years to come. Each month of the 9-months of pregnancy marks new milestones for mother and baby alike. 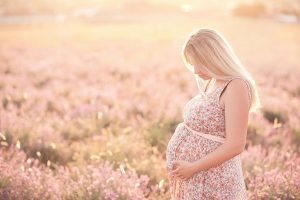 From mother’s tiniest baby bump while the baby is developing the most important organs and features, to the bowling ball sized bump of the third trimester during which the baby is plumping up and allowing the systems to mature, this is a time to treasure. Celebrate these milestones with custom maternity photo to paintings. Pregnancy Is Beautiful. Your body is busy creating a new life which is a very beautiful thing. Once-In-A-Lifetime Memories. You will only be pregnant with this child once. Remember these special memories with maternity photos. Maternity Photos Are Fun! There are so many fun ideas for maternity photos. From the pregnancy announcement to the gender reveal, these are moments you’ll want to remember forever. Commemorate Monthly Milestones. Take pregnancy photos each month to have a keepsake of your child’s earliest beginnings. Choose your favorite pregnancy portraits to turn into unique mementos. It’s a cinch to start the transformation of your maternity photos into canvas paintings. Simply upload your photo, select your size, and customize your photo using our easy-to-use photo configurator. After that, our talented artists get to work transforming your maternity photo into a detailed work of art. Our paintings are created on high-quality canvas and are designed to last for generations. Whether you are looking to memorialize your own pregnancy or are looking for a unique gift for a pregnant loved one, a custom maternity portrait painting would make a cherished keepsake. Don’t wait a day longer to begin the process of capturing your maternity masterpiece. At Thomas Kinkade Portrait Studios, we are so confident that you’ll love your maternity portrait painting that we offer a 30-day full money back guarantee. Upload your photo today and let the magic begin.